Product Packaging: Standard Packaging Embark on heroic journeys with the Knights' Play Box. Valliant knights canfind all the gear they need in this set with a visit to the blacksmith'sfoundry. There, kids can shield their figure in a full suit of armor and havea new sword forged. To start playing, simply fold open the two side panels totravel back in time to the medieval era, filled with jousts, epic battles, andother exciting adventures. Perfect for on-the-go play, all the pieces can bestored inside this portable set and the top can be turned into a handle,making it a must-have travel accessory. 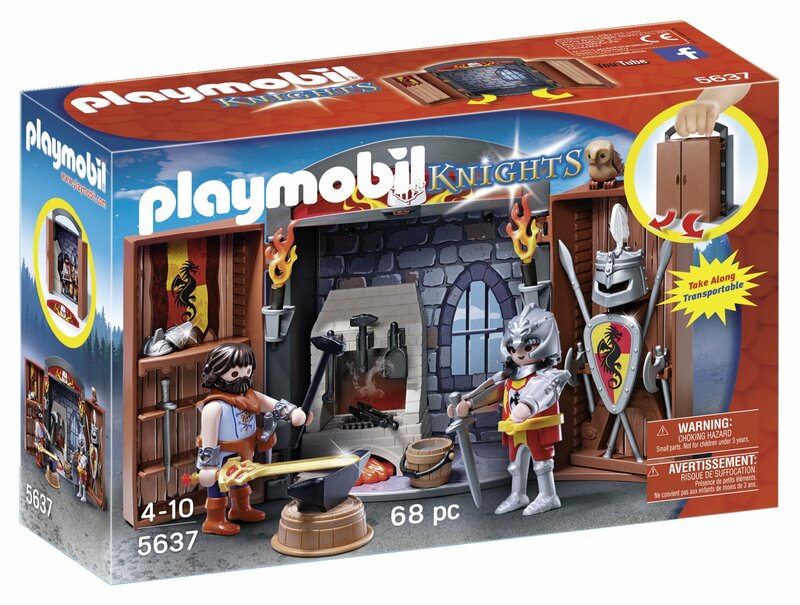 Set includes two figures, armor,helmets, shields, swords, blacksmith tools and forge, torches, fire pit, andother fun accessories. Recommended for ages four to ten. Play Mobil, Germany'slargest toy manufacturer, is headquartered in Zirndorf, Germany and has beenproducing and distributing toys for more than 36 years. The miniature worldsof Play Mobil encourage children to explore and learn while having fun.Children's imaginations are transported to medieval times with the Play Mobilcastle, to the adventurous seas with Play Mobil pirates, and many other themedplay worlds. The figures can bend, sit, stand, and turn their heads to makerealistic role play possible.